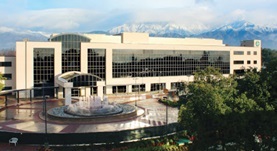 Dr. Derrick Raptis is a well-known pulmonologist in Rancho Cucamonga, California. He received his medical diploma from St. George's University School of Medicine, St. George's, Greneda in 2005. Dr. Raptis completed his medical education with a residency in internal medicine at Drexel University - Hahnemann University Hospital and a fellowship in pulmonary disease and critical care medicine at NYU School of Medicine. He is certified by the American Board in pulmonary disease, internal medicine and critical care medicine. His subspecialty is general pulmonary disease. This doctor works at Pomona Valley Hospital Medical Center, Kindred Hospital Rancho and at San Antonio Regional Community Hospital. He was awarded the honor CMS Stage 1 in 2011.